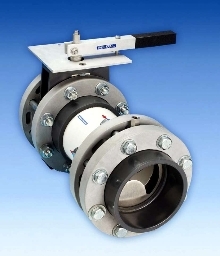 Variable Static Mixer accommodates range of flow rates. Variable Head Loss Static Mixer consists of 2 in-line static mixers in series: one with fixed plate and other pivoting to achieve mixing range from Â½-10 fps with head loss of 3 psi from Â½-8 fps. Offered with beta ratios from 0.7-0.9, plates create combination of vortex shedding and intense shear zone turbulence. Mixers are available in sizes from Â½-120 in. ID, and can be made from PVC, FRP, 316 stainless steel, titanium, or HastelloyÂ®. A new (patent pending) static mixer that features a short laying length and accommodates a wide range of flow rates, with reasonable head loss, is being introduced by Westfall Manufacturing Company of Bristol, Rhode Island. The Westfall Variable Head Loss Static Mixer consists of two in-line static mixers in series: one with a fixed plate and the other pivoting to achieve a mixing range from ½ to 10 FPS with a head loss of 3 psi from ½ to 8 FPS. Unlike conventional fixed static mixers that only work well at a specific mixing rate, this variable mixer operates efficiently over a broad range. Rapidly mixing because of plate designs which create a combination of vortex shedding and intense shear zone turbulence, the Westfall Variable Head Loss Static Mixer is available in sizes from ½" to 120" I.D. Plates are offered with Beta Ratios from 0.7 to 0.9 and these mixers can be made from PVC, FRP, 316 stainless steel, titanium, Hastelloy® and other materials. The Westfall Variable Head Loss Static Mixer is priced from $2,500.00 to $250,000.00 (list), depending upon size and material. Literature and price quotations are available upon request. 16 Peckham Dr. / P.O. Box 7.